"You must become more than just a man in the mind of your opponent." There have been numerous efforts at bringing the Batman to film, with varying degrees of success, beginning with the 1943 serial through the campy television show of the 1960s to the grim deco visions of Tim Burton to the garish and creepy return to high camp under the hand of Joel Schumacher. But none of these have taken a gritty, realistic approach to the character, even though that has long been considered de rigeur in the comic books. Christopher Nolan gets it right, and the result is an action masterpiece of epic scope that finally does justice to the darkness of the character. Based in large part on Frank Miller's seminal Batman: Year One and Jeph Loeb and Tim Sale's The Long Halloween, the story is faithful to the comic traditions while keeping an intense and realistic tone. There's plenty of martial arts action that's not of the typical whoosh wire-fighting silliness but feels like up-close and brutal street fighting combined with flawless technique. At the same time, the quick cutting and unusual camera angles give one the vivid sensation of being part of the fight, just sensing motion but seldom able to clearly get one's bearings. The result is some of the most realistic comic-book action ever to hit the screen, especially when combined with a script that reinforces the internal logic of the story. It's particularly effective in the linking of the three main villains, who are acting in what appears to be separate ways but turn out to actually be more nuanced and interconnected in plausible fashion. The evil is not cartoonish, but textured and layered, with real substance behind it. The casting is impeccable for the most part; Bale is a fine brooding and driven Bruce Wayne and delivers the trademark Batman rasp with aplomb; he carries a barely-concealed rage that projects the serious issues behind the cowl. Caine is charming and avuncular as Alfred, a suitable character for his world-worn face. Liam Neeson falls into the familiar role of Jedi Master again, but it's not as if he didn't do that well the first time around. Gary Oldman, as the honest cop, Sgt. James Gordon, is a particularly fine portrayal, nailing the Batman: Year One Gordon 100-percent from the mixed attitude of fear and bemusement at his new ally right down to the look of the character. Oldman seldom gets to play a hero, but he once again turns in a first-rate performance. Murphy's Dr. Crane is a perfect combination of geeky gawkiness and dangerous insanity that works perfectly. The Scarecrow here doesn't have the operatic quality of Burton's Batman villains, but the effects work for his fear gas is truly terrifying, with abundant visions of bats, maggots, and flame. The always reliable Rutger Hauer even gets a small role as the slimy CEO of Wayne Enterprises. The weak link is Katie Holmes, who is easily ten years too young to be playing assistant D.A. Rachel Dawes, Bruce's childhood friend and brief romantic interest. A CG-enhanced Chicago makes for a nice substitute Gotham City, perpetually rain-drenched and grey. The effects work is quite well realized, and a surprising amount of the material on screen is shot live and not created in CG; the result is highly credible and forcefully immediate. There's a particularly fine car chase as the police pursue the Batmobile through the city streets. The city makes the story in these films, for only in the diseased world of Gotham can the Batman and his rogues gallery truly be at home. But the film also makes a point of balancing Wayne/Batman's quest for revenge with an understanding that justice is more than that. Through ample use of flashbacks and intercutting, the world of the Batman comes to a vivid life. Image Transfer Review: The transfer is first-rate, with vivid color and plenty of detail, as befits a new film. It's a very dark picture, but little artifacting of blacks is present. There is nothing at all to complain about here. Audio Transfer Review: Action pictures benefit from a big pounding soundtrack and this is no exception. There's a nice enveloping soundstage and plenty of low bass response, especially in explosions and in the rumblings beneath Arkham Asylum. The score by Hans Zimmer and James Newton Howard comes across with good presence and range as well. Extras Review: The first disc also includes the highly entertaining MTV Movie Awards satire, Tankman Begins, featuring Jimmy Fallon and a guest appearance from Napoleon Dynamite. There's also an anamorphic theatrical trailer. Disc 2 is devoted to a series of eight EPK featurettes totalling nearly two hours. These are pretty well done and more interesting than the usual EPK material. They focus on the writing of the script, Bale's training and the fight choreography, designing the city and the new Batmobile, the costume, filming the finale and Bruce's time in the Himalayas. One of the featurettes is also devoted to Batman's history in the comics and some of the influences on the film, with comparison frames. That comparison can be taken a bit further with the 72-page book that reprints the first issue of The Long Halloween, another take on the origin story by Denny O'Neil, and the first Batman story from 1939. The "Confidential" files give additional background on the allies, enemies and hardware of the Batman, and there's a gallery of a multitude of US, international and apparently unused poster designs. Oddly enough, only these posters are presented with anamorphic enhancement; none of featurettes is enhanced, even though they are presented in a wide 2.35:1 ratio like the principal feature, and could certainly use the extra pixels. A DVD-ROM feature includes a demo of the first stage of the Batman Begins mobile phone video game amongst the usual weblinks etc. It's a solid presentation of supporting material that would have merited straight A's if it had included a commentary. 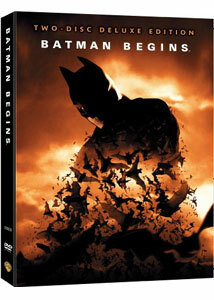 Batman Begins leaps to the forefront as one of the best comics adaptations ever; it's a thrill ride with an epic feel that just doesn't stop, with an entire disc of featurettes and other material to boot.